What is Ruup? 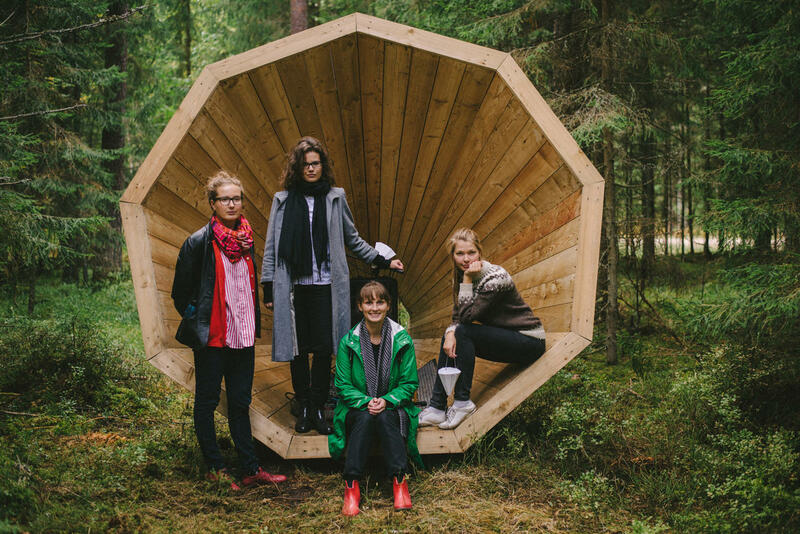 — Wooden Megaphones "Ruup"
"Somewhere in Estonia, amid the lush green leaves, encroaching moss and dark bark of the country's forests, is a massive megaphone. 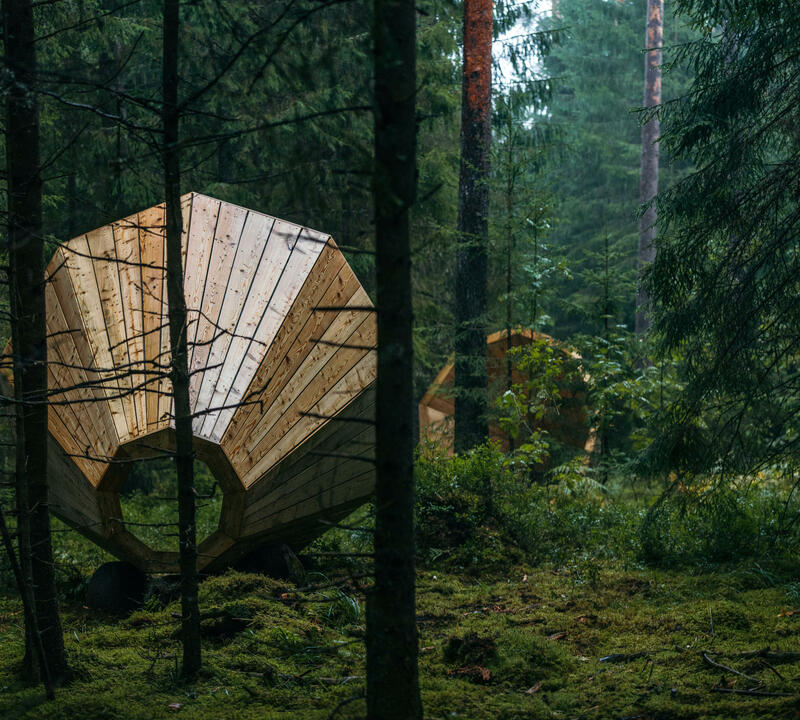 Made of beautifully finished wood, the giant horn sits beside two others of its kind, each pointed in a different direction, looking as though they are ready to project, or perhaps capture sounds from different corners of the woods. Large enough for an onlooker to climb inside, the idyllic carvings look like the remnants of a centuries-old fairy tale; the one bits of remaining evidence that something magical happened between the trees." Where did the idea for ruup come from? Hannes Praks: A year ago, we started a course for our first-years over at the interior architecture department of the Estonian Academy of Arts. It was called ‘public forest library’. 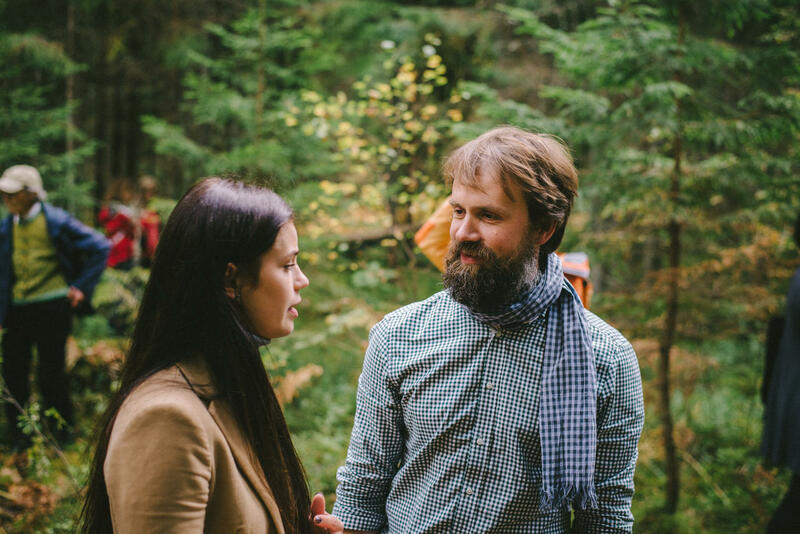 Right in the beginning, we sent the students into the forest for a few days, accompanied by an acclaimed Estonian author and semiotician Valdur Mikita, to look for input and inspiration for a possible concept. The forest seminar failed utterly, because after half a day of intellectual chatter, a helicopter started to circle the forest and a moment later the woods were filled with police. The reason – a local granny had gone mushroom picking and had got herself lost. Students spent the rest of the seminar helping the police, calling out for the lost old lady. Back at the university, they continued their work on designing the forest library. The group, and to some extent the tutors, felt a bit dubious about taking books to the woods. 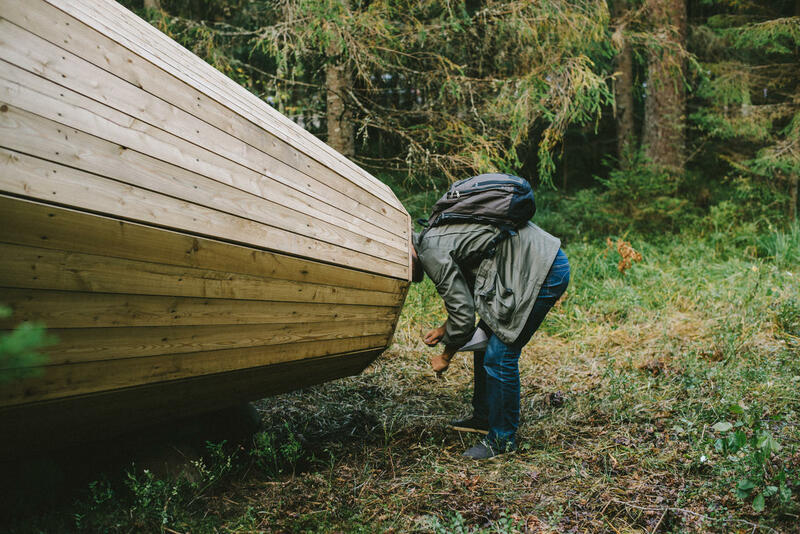 They couldn’t really figure out how to solve the task from a practical angle – just imagine leaving the volumes in an installation in a humid cold Northern forest for the winter. 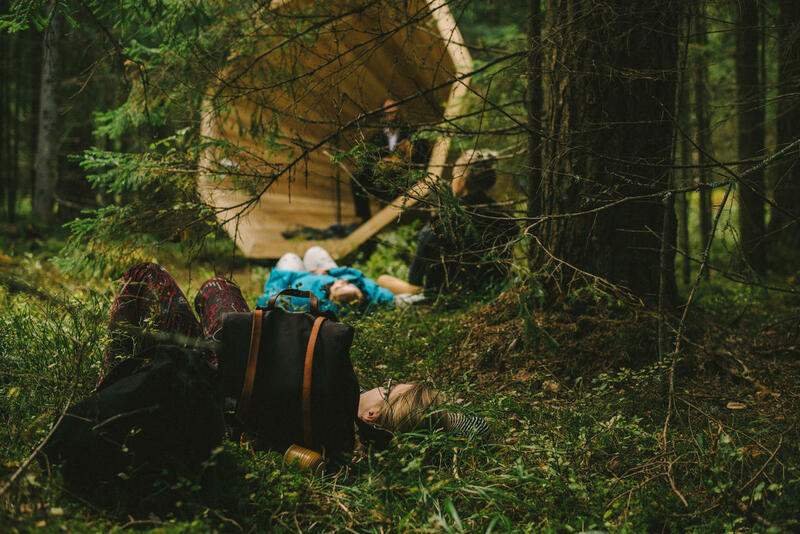 And at this point Birgit Õigus saved the whole project, figuring out that instead of reading in the forest, you should rather aim to read the forest around you. You could also think about it in another way – the megaphones are inspired by the search for the mushroom-gathering granny and symbolise all the calling out in the forest. 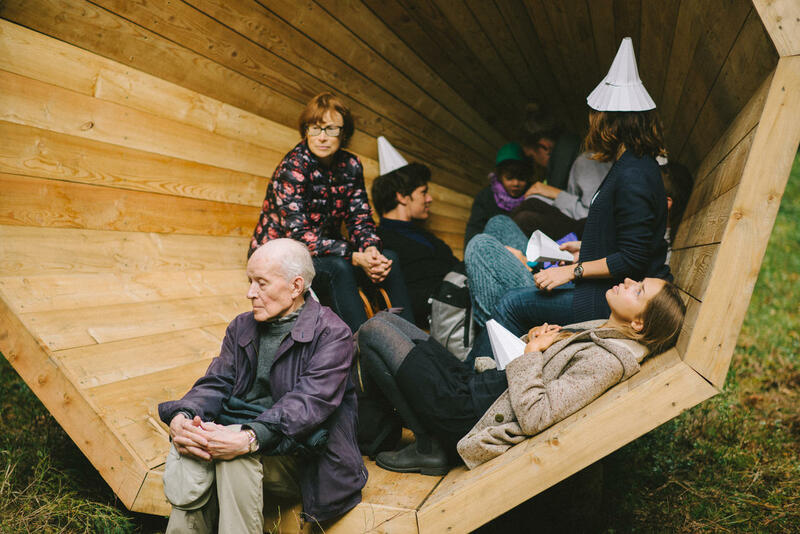 Can you describe the experience of being in the middle of the installation? 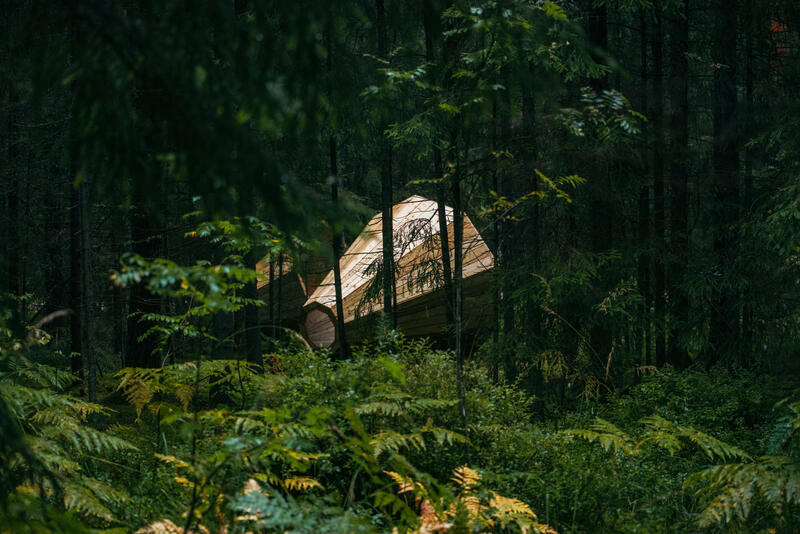 Aet Ader: The megaphones take the hiker by a surprise – it’s a shift in scale, an unexpected, absurdly large object in the tranquil deep woods. It’s an extremely symbolic reference to the sense of hearing and to the process of listening. 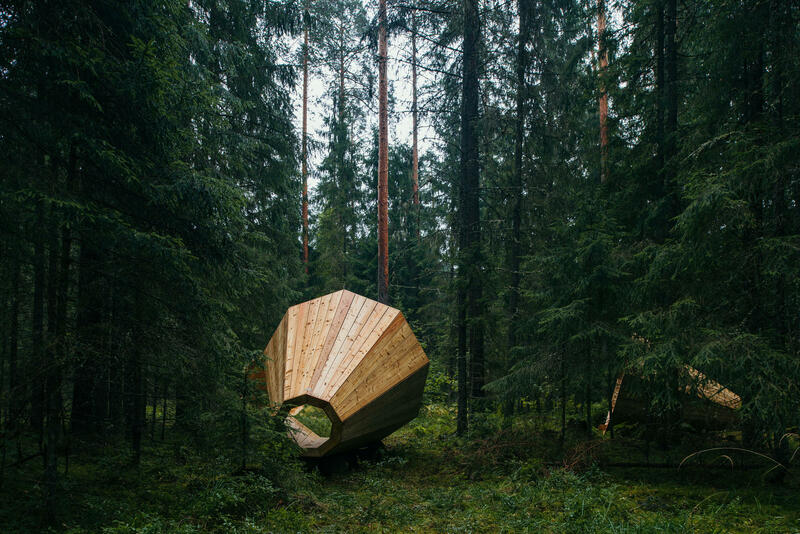 The reference itself might be enough to inspire people to listen to the cosmos of the forest. When you pay attention you might notice the way the sounds are amplified at the intersection of the three megaphones. 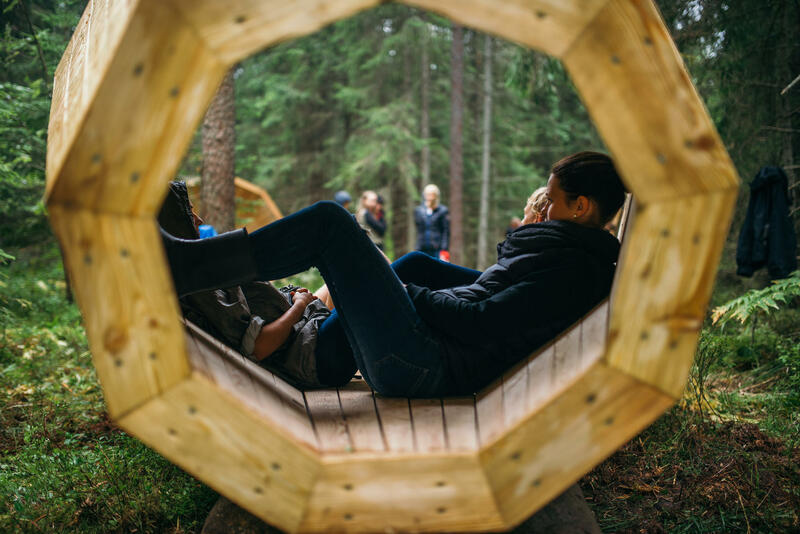 You can sit down comfortably in each of the megaphones – the sides of the megaphone offer support for your back at the right angle and frame the sky on one side and moss and blueberries on the other. The installation shakes the perspective. It seems to me that in the world that’s spinning faster and faster, the secret really lies in simple methods such as focussing – erasing the background noise and the unnecessary, framing it out. What are the components that every contemporary architecture lover should pay attention to? Aet Ader: Every traveller could commit to the moment. I would say that hikers usually take to the forests to perceive the slowness of the woods and to experience the specific risks that contemporary urban environment does not offer. Spending time in an unusual environment enhances your ability to focus. I’d even suggest going to the spot alone – to hear your own thoughts. 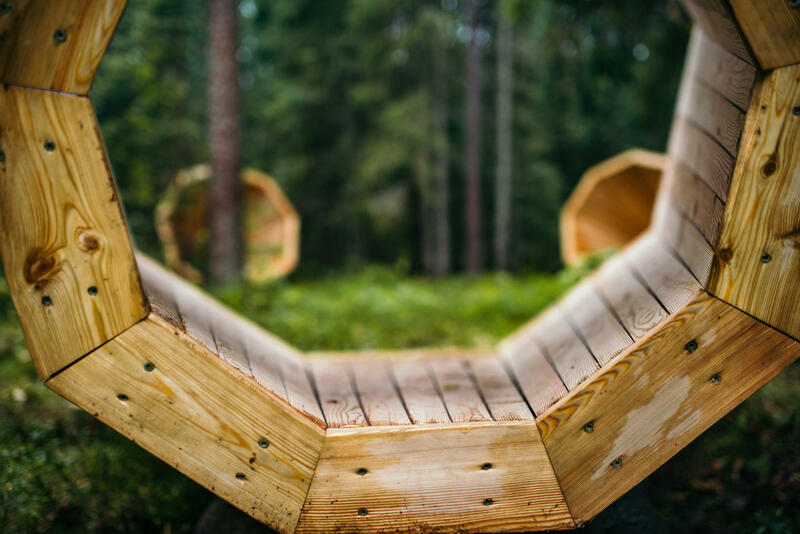 Materials-wise – the installation is made of larch and the boarding is sawn at the right angle to amplify the focussing effect even more. 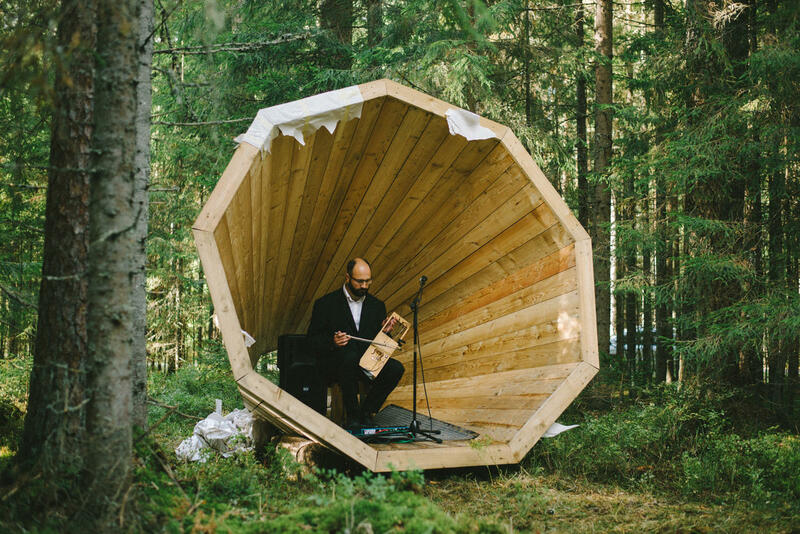 We consulted an acoustics engineer to get it right. Why do you want to listen the sounds of the forest? Hannes Praks: The question leaves me in a predicament. Indeed, what is there to listen to? Sure, the song of some birds is quite beautiful, but do we really need an installation for this? I believe that the biggest value of the megaphones is listening to your own thoughts via the sounds of nature. 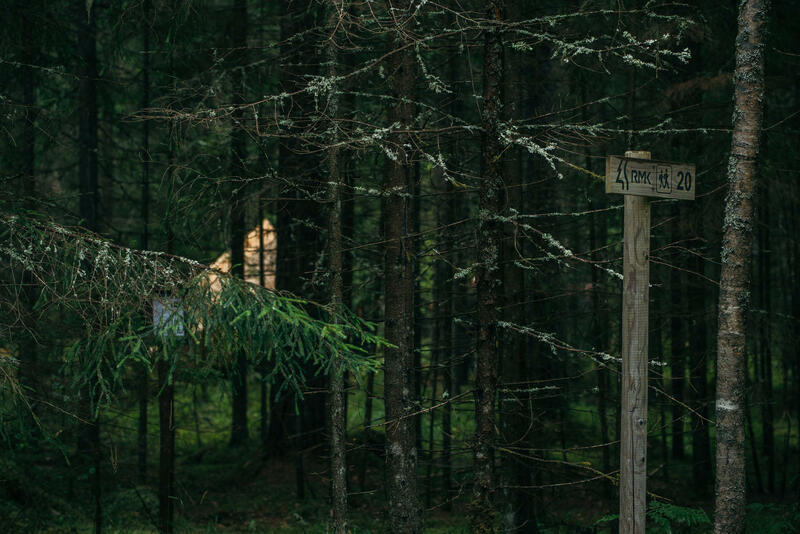 The location is right on the edge of Estonia, deep in the forests. Mobile reception is shaky there, which means there’s no means to keep up with the newsfeed of social media. Meeting your own thoughts can be a nice interlude, but also a frightful experience. 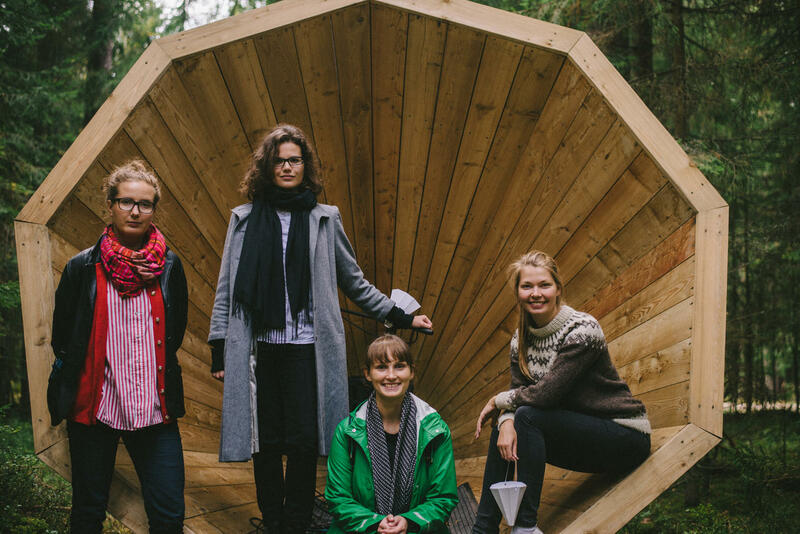 Read more about the design studio run by architecture office b210 for Estonian Acatemy of Arts interior architecture students that resulted in wooden megaphones Ruup.